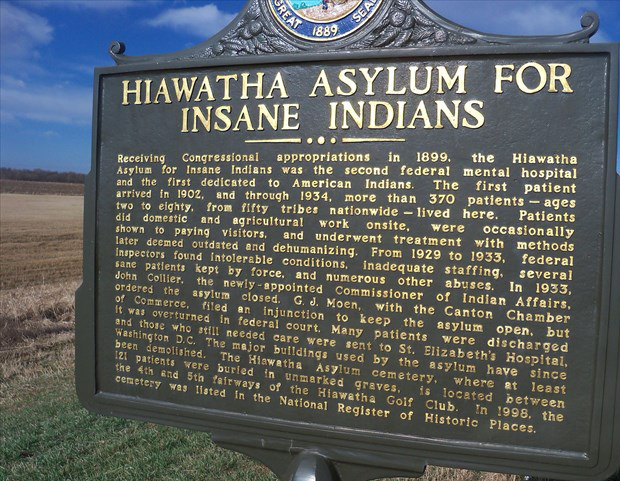 There are very few physical reminders that the Hiawatha Asylum for Insane Indians in Canton, South Dakota ever existed. A bronze sign on the east side of town along U.S. Highway 18 offers a brief history. 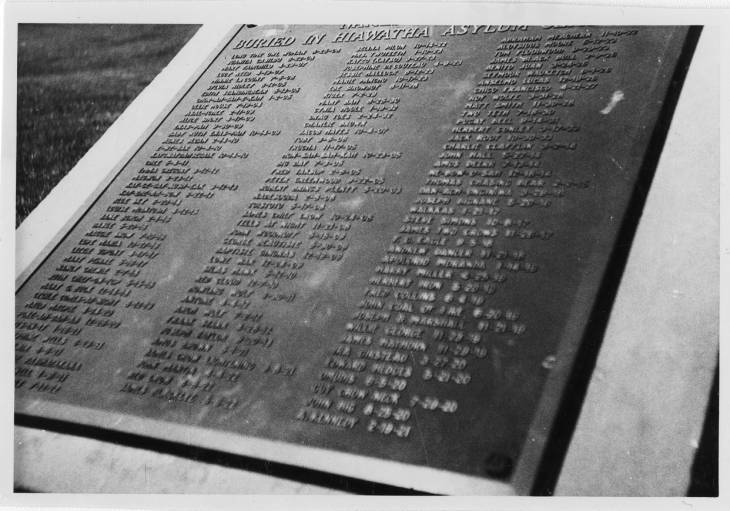 Nearby, there's a list of 121 names on a metal plate set in concrete. The plate is a memorial to the inmates known to have died at the asylum between 1902 when it opened and 1933 when it was shut down. Their graves occupy a spot between fairways at the local golf course. 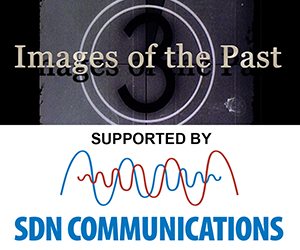 There are also very few known photographs of the asylum, its employees and its inmates. In 1898, South Dakota U.S. Senator Richard F. Pettigrew pushed through a funding plan and federal authorization for a hospital for "insane Indians." The asylum would be built in Canton, South Dakota. There was some debate about the need for such a facility but Pettigrew managed to convince Congress that there was. 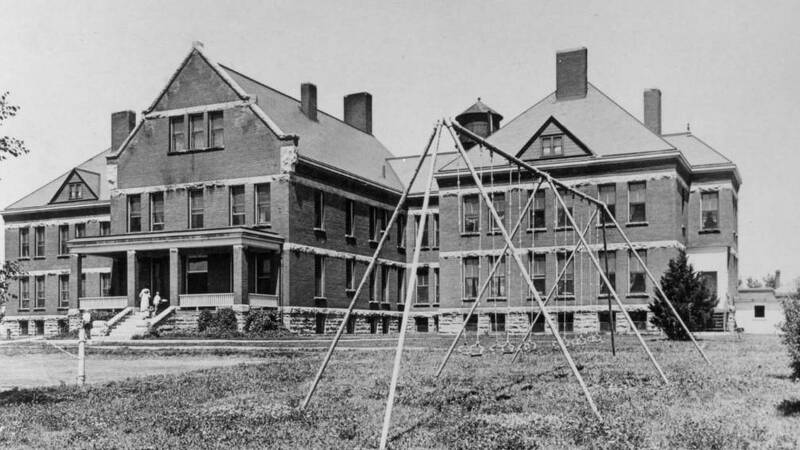 1899-1902 Construction of the "Hiawatha Asylum for Insane Indians." Oscar S. Gifford, a Canton lawyer and congressman, is named director. 1902 - The first patient arrives. 1908 - Dr. Harold R. Hummer replaces Gifford as director. 1909 - Fourteen employees draft a formal complaint against Hummer alleging workplace hostility, mismanagement, and extremely poor living conditions and patient treatment. 1910 - A federal Indian Office investigation clears Hummer of any wrongdoing. The complaints are written off as a dispute between Hummer and asylum employees. 1910-1926 Continued federal funding leads to expansion of the asylum. Additional buildings are constructed and additional property is acquired. 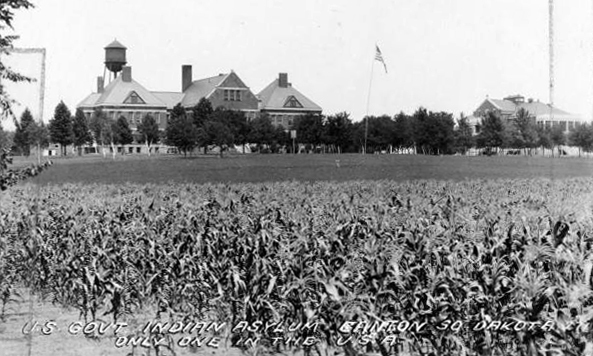 1929 - Dr. Hummer asks the federal Indian Office for an inspection of the facility, citing "deplorable conditions." Dr. Samuel Silk is sent to conduct the review. Silk's report described "intolerable" conditions at the facility and was critical of nearly every aspect of the institution. Closure of the facility is recommended but South Dakota's congressional delegation argues against it and funding continues. 1933 - Dr. John Collier is named commisioner of the new office of Indian Affairs. Within a few months and after review of the Canton Asylum's records and inspection reports Collier dismisses Hummer and begins the process of closing down the facility. Some Canton residents strongly oppose the closure and sue. A court decides that the federal government's financial committment to Indian health care does not oblige it to keep the asylum open. December 1933 - Sixty-four patients are moved from Canton to St. Elizabeth's Hospital in Washington, D.C.